© Copyright Cynthia Brush. All Rights Reserved. ISHA Certification in Clinical Aromatherapy workshops was where I learned to dowse with a pendulum. Such a handy technique for information gathering (divination) tool! I use dowsing for myself and in clinical practice with family, friends, and clients. 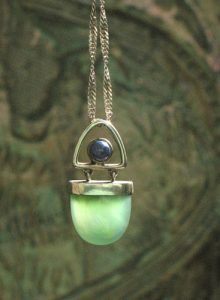 My pendulum is a silver pendant set with a smooth green adventurine or chrysoprase stone and small round cabochon of lapis. The indigo hue of lapis correlates to the color frequency of the eye center while the life-affirming green adventurine/chrysoprase glows with heart chakra energy. The simple abstract design reminds me of a woman reaching to the heavens…or practicing QiGong. Dowsing may be done with ANY object dangling freely from a string, filament line, cord, or chain…even a teabag (!) once you’re comfortable with the technique. Dowsing is easier to learn with an object that has a bit of weight. In the aromatherapy classes, watched one of the ISHA instructors dowse with a tea bag. To my astonishment, it spun wildly like a gyroscope! Then I experimented at home and failed miserably. Attempted again, at another time and the teabag worked just fine! My intuitive sense and personal preference is to use a gemstone pendulum, rather than glass, since gemstones are sensitive to vibrations and resonate at particular frequencies. Pure metals – silver, copper, gold, or platinum may work well, too. If you’re new to dowsing, it may take a several experiments to find a pendulum that resonates with your energy and will ‘dialog’ with you. Start with an object you already own…and like. I met an aromatherapy student, who’d been struggling with her glass pendant for more than a decade. I held her pendant, asked a few essential oils related questions….and it immediately responded. Receptivity is the key. ~ Hold the pendulum in your palms like an offering. Start with prayer. I always begin by asking Creator, my own or my client’s higher self & spiritual guides for guidance as I know NOTHING. And I always ask for the healing session to be for my own or my client’s Highest Good, depending if I’m doing self-care or healing work (without ANY projection or visualization on what that ‘highest good’ may be….since I don’t know). ~ Then I ask if the issue to be treated is Emotional or Physical? And what the issue is? It’s handy to develop a written list to target issues quickly. ~ Depending on the pendulum’s response (Clockwise circles = Yes. Any other motion or lack of motion = No or Neutral), I research appropriate oils / blends and then use the pendulum again to see which oil is best for the day’s treatment. And where & how to apply the essential oil/s. 1) BELIEVE in guidance…and your pendulum’s ability to respond accurately to your queries. 2) RELAX. Ground yourself by remembering your connection to the earth. 5) Be PATIENT. Sometimes it takes several seconds for the pendulum to get going. If the pendulum doesn’t respond. Phrase the query in another way. Or ask a different question. Or try again later. 6) And keep in mind the healing ethic of not asking about other people’s situations without their advance PERMISSION. To our readers: If you have questions about dowsing, feel free to email me.